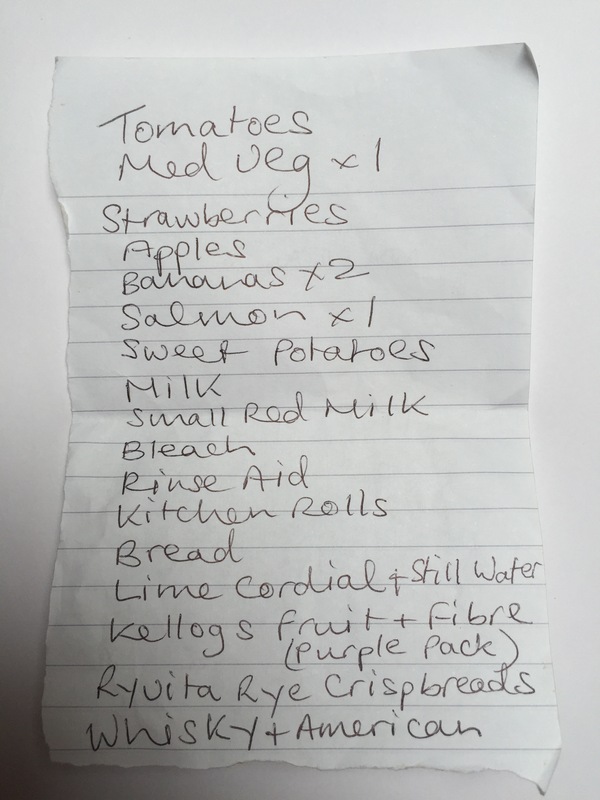 This shopping list owner likes detail, 2 bananas precisely, “Kellogg’s”cereal rather than just cereal, “Ryvita Rye Crispbreads” when Ryvita would have sufficed. In fact I think this list was written for somebody else to do the shopping, the numbers and brands are instructions. Does whisky and American mean whisky and whiskey? Tomatoes, Mediterranean vegetables x 1, strawberries, apples, bananas x 2, salmon x 1, sweet potatoes, milk, small red milk, bleach, rinse aid, kitchen rolls, bread, lime cordial, still water, Kellogg’s fruit and fibre (purple pack), Ryvita rye crispbreads, whisky + American. I like how bleach is tossed in randomly in the middle, like he or she realized they would have to clean something off after their whiskey fest. And I always find it fascinating when people specify certain brands of items. I do that myself. Another great post and list! Keep them coming! Many thanks for the support, it is very much appreciated. written by a woman for a man, giving precise instructions. There are many varieties of Ryvita crispbreads, so Rye needs to be specified otherwise there is a danger they will buy the wrong Ryvita! This is a shopping list from the chef to another who is doing the shopping. It may have been given by telephone or written by them. Time is a factor here – the chef cannot buy the items or has to stay and look after the baby.